"We have a draft of the framework that has to be fleshed out before it becomes an agreement," U.S. special peace envoy Zalmay Khalilzad told the New York Times in an interview in Kabul after six days of talks with the Taliban. "The Taliban have committed, to our satisfaction, to do what is necessary that would prevent Afghanistan from ever becoming a platform for international terrorist groups or individuals." However, there was no sign that the Taliban had agreed to U.S. demands such as that they commit to a ceasefire before the withdrawal of U.S. troops or that they engage in direct talks with the U.S.-backed government in Kabul, analysts said. "While the progress in Doha has been the most significant to date, reaching a final agreement is far from guaranteed, as (these) two major sticking points could still derail the process," Ahmad Majidyar, a fellow at the Middle East Institute, wrote on the Washington thinktank's website. Another U.S. official in Kabul, who spoke to Reuters on condition of anonymity, described "significant progress" in the talks in Qatar but said more negotiations were needed on the issue of the timing of the ceasefire, which looms as a sticking point in the next round of talks on Feb. 25. Taliban negotiators want a full withdrawal before a ceasefire but the Americans want it the other way around, the official said. "Of course we don't seek a permanent military presence in Afghanistan," the official said. U.S. forces in 2001 toppled the country's hardline Islamic leaders for harbouring the al Qaeda militants responsible for the Sept. 11 attacks that killed about 3,000 people. "The President has made clear that his priority is ending the war in Afghanistan with an agreement that ensures the country never again serves as a base for terrorists to attack the U.S. or any other country," the official said. "To achieve such an agreement, the Taliban must engage with other Afghans and all sides must agree to resolve their differences through peaceful means," he added. "It's encouraging," Shanahan said of the talks. Asked whether he had been tasked with planning a complete withdrawal from Afghanistan, he said: "I have not." A U.S. official said in December that President Donald Trump was planning to withdraw more than 5,000 of the 14,000 U.S. troops in Afghanistan, the latest sign of his thinning patience with America's longest war and overseas military interventions. Trump last month decided to pull U.S. troops out of Syria as well. Both U.S. officials and the Taliban hailed progress after the talks with Khalilzad ended on Saturday. Taliban sources told Reuters that the United States had agreed to withdraw foreign troops within 18 months of the signing of a pact but the U.S. official said a timeline was not discussed. 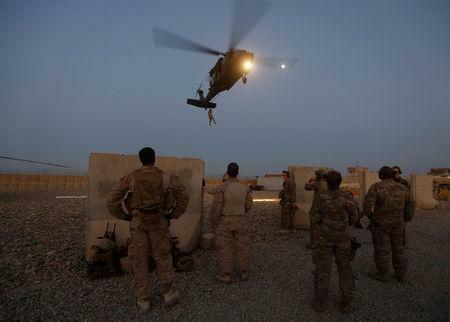 The U.S. troops in Afghanistan are part of a NATO-led mission and a U.S. counter-terrorism mission largely directed at groups such as Islamic State and al Qaeda.